Cooking is an art and a science. And if you ask UW professors Lilo Pozzo and Nate Sniadecki, it’s also the perfect window into a smorgasbord of engineering concepts. Pozzo, of ChemE, and Sniadecki, a mechanical engineering professor, have created a culinary-focused freshman course called Kitchen Engineering to introduce students to fundamental concepts across all of the engineering disciplines. As UW freshmen can now be accepted directly into the College of Engineering, this new class can help them make the best choice from their menu of engineering options. Pozzo said that developing this course made her think about how cooking — a personal interest of hers — relates to more than just chemical engineering. Colloids, her research focus, show up everywhere in the kitchen in the form of foams (e.g. whipped cream), emulsions (e.g. mayonnaise), smoke, and more. But chefs also need to know about the structure of muscle, as do bioengineers. And developing designs for stand mixers, microwaves, dishwashers and even efficient kitchen layouts are, at their core, engineering problems. Pozzo and Sniadecki collaborated with area chefs to present their lectures. 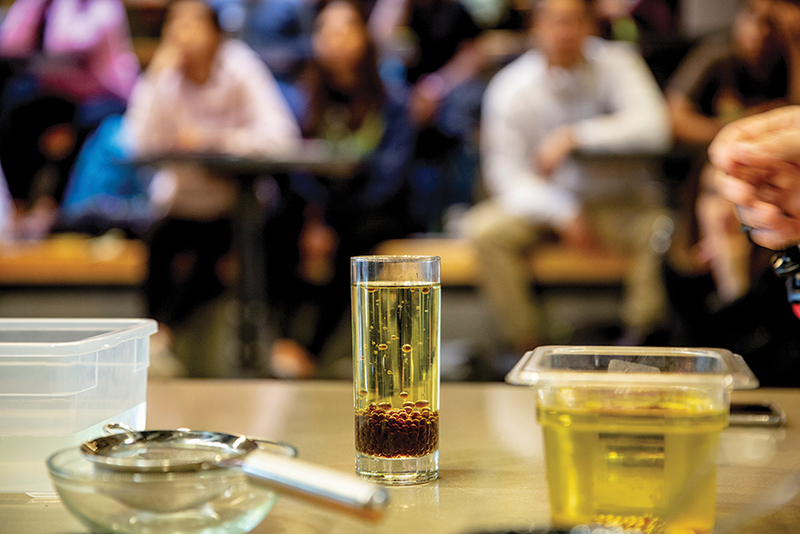 They designed the course so that one class per week featured cooking demonstrations, while the other dove deeper into the related engineering concepts. In the investigation of heat transfer, for example, chefs compared how cooking duck breasts differed by starting them skin up versus skin down. The results clearly showed how the skin, when facing down first, insulated the meat and prevented it from overcooking. At the same time, the fat rendered nicely and the skin crisped. The professors won a Strategic Instruction Initiative award from CoE to develop Kitchen Engineering. The purpose of the award is to move the curriculum toward more project-based learning to engage first- and second-year students. They debuted the course in spring 2018 with an enrollment of 36 and hope to offer more spots in the spring 2019 class. Just imagine the outcome: college freshmen who have enthusiasm for engineering — and know their way around a kitchen.